Well known for her plein air paintings, figures and murals Candy Barr’s paintings are captured alla prima, fresh in color, and reflect an immediate response to the subjects being painted. Inevitable changes of light force her to paint spontaneously with animated brushwork. Intense observation for accurate draftsmanship and prolific production deepens and insures her sense of place. Barr has taught drawing and painting privately since 1975, living in Warren, Vermont since 1978, and has been faculty with Goddard College, Burlington College, Community College of Vermont, Woodstock, Bethel, Hamden Hall, CT, and Hillsboro, N.H. She is a well respected juried artist with the Vermont Arts Council doing residencies throughout the state for over 18 years coordinating murals, mosaics, banners, plaster sculptures and individual projects. Karla Bove creates truly unique decorative blackboards handcrafted on wood using her original designs. These chalkboards, sealed to form a durable surface, and enhanced with a practical corkboard, can be custom-designed for personal or professional use—picture one in your kitchen, entry hall or great room. Or, if you are in the service business— restaurant, deli or café— and want to create a daily menu, they can be designed with your logo and catered to any special theme. Use them for business or pleasure or give them as a gift to the friend who has everything. "I've always been able to draw but I failed high school art. They wanted me to draw tables and chairs but I was already drawing figures...so I flunked. Thus encouraged, I went on to become a professional artist. I worked as a freelance illustrator in New York and also as a printmaker producing etchings and lithos. The influence of brilliant teachers has been monumental in my development as an artist. I travel to paint and the experience of observing a masterful painting has been a critical factor in my development as a painter. I study great masters such as, Carravaggio, 17th Century Dutch masters, 19th Century French academicians, Inness, Sargent, Homer and others. My classical painting instruction began 20 years ago when I was directed to a class taught by a former monitor of the Frank Mason class, Bill Darling. A few years later, I had the great fortune to study with the internationally known painter, Frank Mason (American, b.1922) who has taught 50 years at the Art Students League in New York. His teacher, Frank Vincent Dumond, was a principal painter at the Lyme Art Colony, Lyme, Connecticut, early in the last century. The influence of these brilliant painters and teachers has been so monumental in my development as an artist, that it is hard to imagine that it could have happened any other way. I am compelled to try and represent the beauty I see in the world. 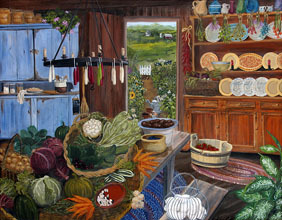 Anne Cady's distinctive oil paintings are inspired by the Vermont countryside that surrounds her. Her recent travels on the back roads of California and Southern France have begun to influence her newer work. 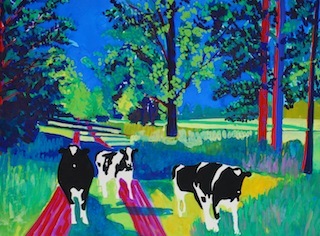 Her paintings are playful and bold, full of vibrant color and spirit. They are held in collections throughout the U.S., Canada, New Zealand and Europe. Before embracing a career as a full time painter, Anne was an art educator who founded and directed "The Children's Art School" for many years. Vermont has been Anne's home for most of her adult life. She is a graduate of Middlebury College, the mother of four children and the proud grandmother of five. Her home and studio are located on a small horse farm in New Haven, Vermont where she lives with her husband and youngest son, Rider, two labs, and five horses. "Through my paintings I am able to journey back to that slower country rhythm of the past, away from this hurry up world and into those open spaces that are so quickly disappearing. While on this ride I can be playful with the harmonious patterns of fields, forests and mountains that repeat themselves again and again within the landscape." Jessica is a freelance artist and illustrator&nbsp;living in Middlesex, Vermont, who has studied at the Museum School of Fine Arts in Boston, California College of Arts and SUNY Potsdam. She is known for her small acrylic paintings of bugs, fish and leaves. Inspired by light, texture and color exploration, these subjects provide her with the perfect vehicle. 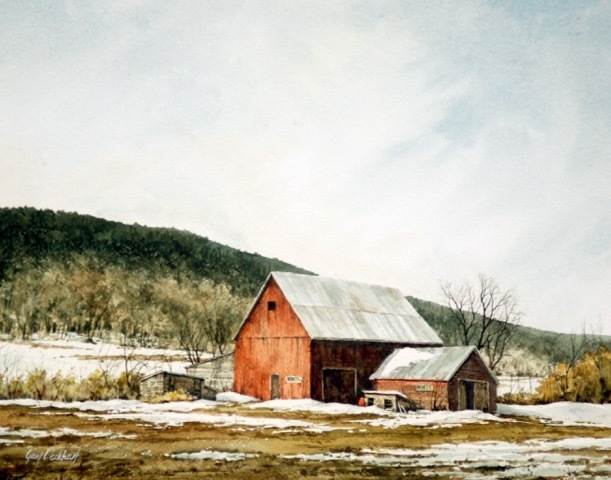 I am particularly interested in capturing the rural beauty and rustic quality of the Vermont and New England scene and picture it in a way that others will look at it with a new vision. I want my work to be visually soothing and comforting while creating strong emotional responses of a simpler, more bucolic life. Gary C. Eckhart grew up in the picturesque Lehigh Valley of Pennsylvania.. 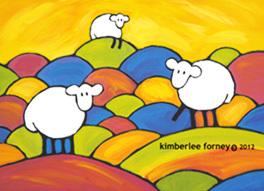 Growing up in northern Vermont, Kimberlee Forney enjoyed creating art at an early age. She finds her inspiration among the beautiful Vermont landscape, within music, animals, people, and her daily surroundings. She appreciates the healing qualities of art and it’s communicative and emotive powers. She is grateful to be able to express her feelings and ideas through her creations. 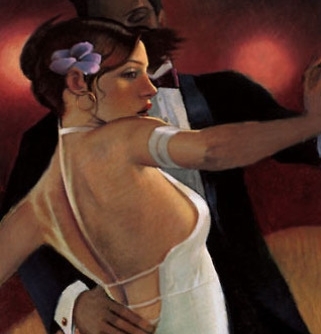 Early in her art life, she concentrated on realistically representing the world around her. She developed her artistic and technical skills while attending Allegheny College in Meadville, Pennsylvania. While there she studied various artistic mediums, including printmaking, lithography, sculpture, drawing and painting. The study of psychology and the German language and culture further inspired her and influenced her artistic interests and development. She received her Bachelor’s degree in Studio Art in 2000. After graduation, Kimberlee’s fantastical style developed out of a basic idea involving a lively and musical bar scenario with human-like forms embedded in the scene (titled “Jazzy at the Bar”). Her business, Natural Expressions, was formed and other pieces involving various cultural scenes, animal forms, and landscapes soon followed. Her favorite subjects to explore relate to the beauty and spirituality present in the natural world and in the cultural world surrounding us. I am, at heart, a landscape painter. From as young as I can remember the earth has been my solace and has instilled in me a sense of wonder and excitement. I’m moved by the beauty I see around, me whether it’s in the desert Southwest, European villages or my own Green Mountains of Vermont. Painting the outdoors, truly observing the land is, for me, a spiritual endeavor, capturing a transitory moment in time. 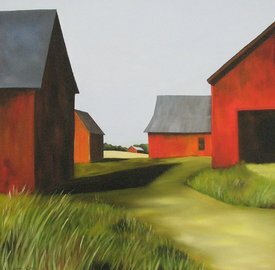 I paint what I love - working farmland and barns, animals, the forests and waters of Vermont and beyond. My painting style tends toward the impressionistic. I take a ‘painterly’ approach which allows the brushwork to show and strive to create texture in my paintings. The bold use of color is something I’m drawn to as well. My work is continues to evolve as I explore the painted surface and express my emotions in my work each day. Art has been woven throughout my life. As a child growing up in Indianapolis, I took oil painting lessons at an art center where the instructors, artists descended from the famed Brown County Art Colony, mentored me in the art of painting the landscape. I continued with a focus on art through part of my college career until switching to another of my passions, language. When my husband and I settled in Vermont and started a family, I transferred my love of painting to ‘painting’ in my garden, designing and planting lush mixed perennial borders and eventually developing a landscape design business. I returned to painting in the late 90’s when I could no longer NOT paint! An 1850’s farmhouse in Randolph, Vermont, has been our home since 1977. I’ve watched with joy the ever-changing light, seasons and cycles of activity on the farm beyond us during these many years. 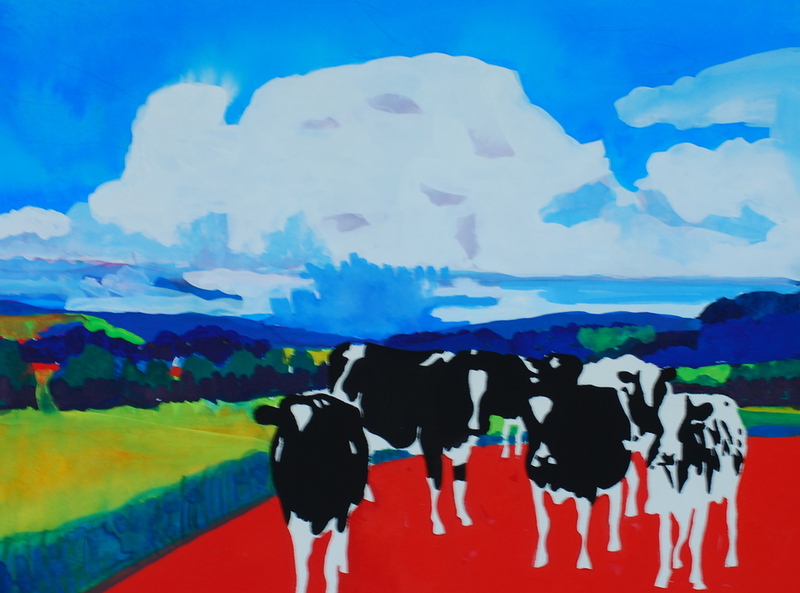 Barbara’s primary inspirations are the colors and shapes of Vermont’s varied landscapes. She works to capture on canvas the play of light and shadow on structures and the land itself, to convey in her paintings both what she sees and how she feels about it. Barbara’s also a passionate sailor, and water and sailboats often find their way into her work. Not quite abstract yet not quite representational, Barbara’s paintings reflect the basic elements of an approachable, identifiable context, but not the details. Working with color, shapes and light, she invites viewers to share her vision of her subject matter—or to create their own. The woodland habitat that surrounds my home and studio in Huntington, Vermont has been a wonderful source of inspiration for me. I often find myself walking the forest floor gathering leaves and other natural materials for my simple yet elegant notecards, prints and fine art. Some of my leaf designs include beautiful handmade paper that I make throughout the year. As an artist, I always enjoy painting the spectacular ridge line view of Camel's Hump from my hillside gardens on Texas Hill. My art is my avocation. I have painted for over 25 years purely for the joy of it. Over the years I have learned the journey is as important as the finish. That is my fulfillment. I prefer to create art rather than interpret it, as this is an individual endeavor. We look within for a reaction to the art we view,whether it is delight, disgust, confusion or joy. 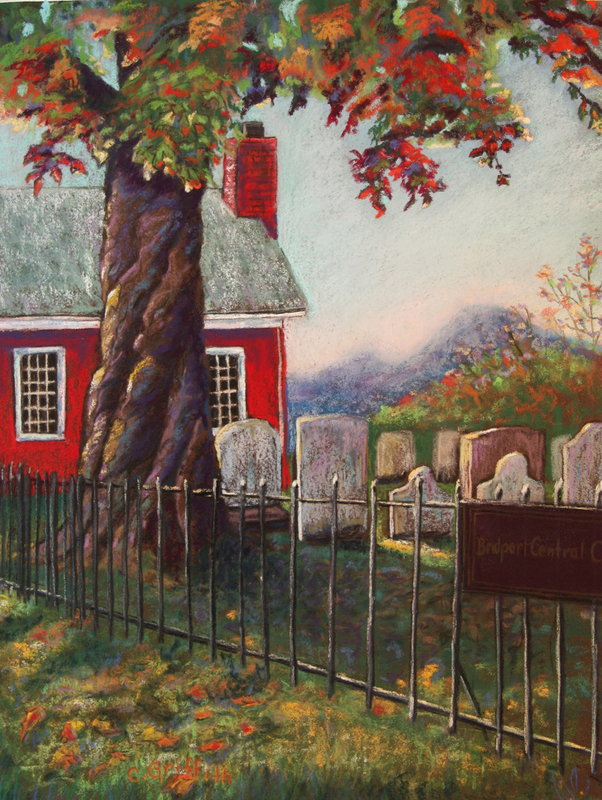 I have exhibited in many eateries around Vermont as well as the Edgewater Gallery, the Bryan Memorial Gallery, the Jackson Gallery, UVM medical center, BCA arts, and the SPACE gallery. I am essentially self taught, but have taken classes at the Arts League in NYC , CCV , BCA as well as workshops around the state. My professional education is in nursing and I presently am a labor and delivery nurse at UVM medical center. I live in Charlotte with my husband Frank, horses, dogs, chickens and a cat. I have three grown children, one grandchild and another on the way. Painting birds has been something I think I’ve always done. When I visit my mom I see paintings of owls, gannets, chickadees — all hung proudly in her home — and all done by me when I was in high school. 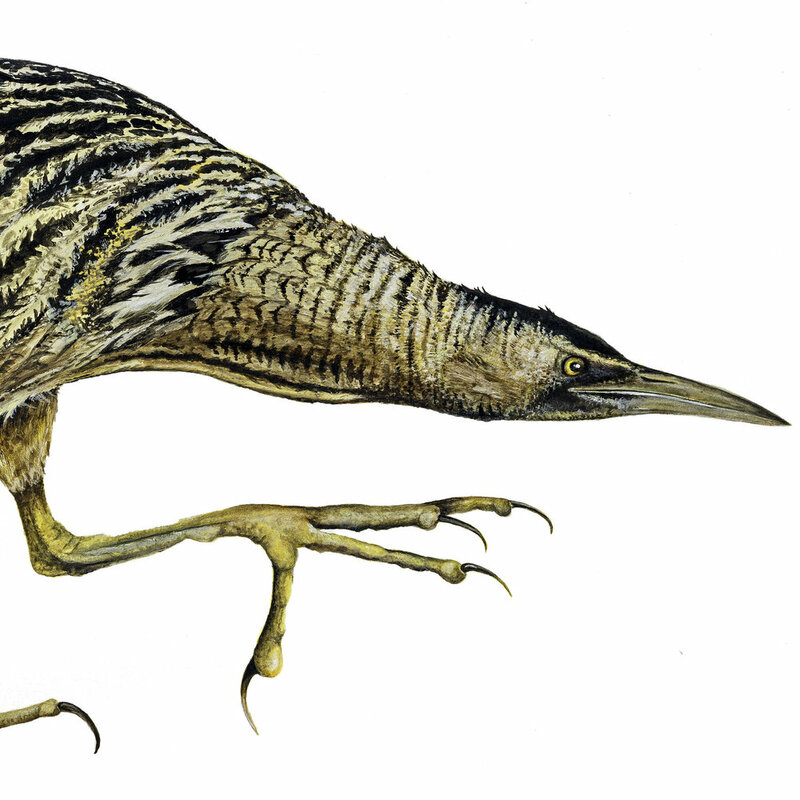 At one point I studied ornithology merely to be able to make my avian paintings more accurate. But life took me on another path and when I moved from NY to Vermont in 1976 I began to work in the graphic design field. Eventually, with a family to help support, I stopped painting and started my own graphic design studio, RavenMark, Inc., which focuses on environmental conservation work. Now, 40 years later, I’m still in front of the computer with my business, but have also started to paint birds again. This time around I focus more on the essence of the bird, trying to capture a mood or a personality, not being so concerned about anatomical accuracy. Still, its hard for me to get away from the detail and physical beauty of these creatures and my work tends to be more realistic than fanciful. I am fascinated by creating light and color with paint. I feel amazement when observing the colors of nature and want to bring these feelings into my canvases. I want my paintings to be a visual meditation on light and color, drawing the viewer into a deeper relationship with nature. I love to work with the luscious colors of oil paint.Using brushes, oil paint, oil sticks, palette knives and rags, I build up layers of paint on canvas, creating a rich textured surface of broken colors. With this layering process I’m able to achieve many subtle color combinations and contrasts, bringing a luminosity and glow to my paintings. Nature inspires me. I feel awe when I see the variety of forms, intricate patterns, and vibrant colors. Drawing and studying these natural subjects, I am aware of a power much greater than myself. My paintings begin with time spent on-site, sketching, taking notes and photographs. In my studio I work with paint to convey my awe and deepest appreciation of nature. I have been very inspired by the Impressionist and Post-Impressionist painters. Using broken colors, building layers of small dots of paint, I want to continue in this tradition, adding a contemporary focus on surface and texture. My work draws from a loose imaginative landscape, using photographic images taken by myself, or found. Beginning with a memory, or a word, the paintings form visual narratives that are both mysterious and familiar. Woody Jackson lives outside of Middlebury, VT with his wife Ingrid and five boys,Bjorn, Leif, Macon, Ebenezer and Silas. He has no cows of his own, but prefers to make his neighbors cows famous. He finds Vermont is home for the soul as well as the body. He graduated from Middlebury College in 1970 and received a master's degree in fine arts from Yale School of Art in 1980. 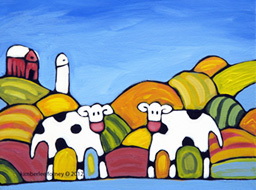 Famous for Holstein cow paintings, he is inspired by the barns and hills of Vermont dairylands. Not all of his paintings involve cows, as evidenced by his intensely hued watercolors of churches and landscapes of New Mexico. Woody has also embarked on a new career as a writer, having authored the children's book Counting Cows; and its sequel, "The Cow's Alfalphabet". Woody Jackson's company, Holy Cow, Inc., markets his cow goods worldwide. "All my artwork has always been inspired by the land, from apple orchards, vegetables gardens, New Mexico deserts, dairy farms, and even the New York City waterfront. The land in turn is changed and inspired by time and the seasons. The light is different through the day and month to month. Lori has been creating greeting cards for friends and family all her life. They are handpainted using water soluble markers and/or pencils. The originals all have poetry specific to the person for whom the card is intended. The designs have been reprinted with condensed generic versions of these poems and many are blank. I paint to record a daily narrative of my life outside. I have always, going back to the time that I was a small child, been compelled to tell stories through visual imagery. While painting, I find that I am my most authentic self. In my recent work, I am attempting to further simplify and distill down my story as much as possible. I am working to use shapes of color, and fewer details, to get closer to the essence of an idea, of a moment in a day. Susan Larkin is an award-winning landscape painter who makes her home in the Lake Champlain Islands in Vermont. She works in oil and pastel and has been painting full time for over 15 years. Before working as a painter, she worked in clay, producing Raku pottery vessels. Susan holds a BFA from Maine College of Art, and a MAT from Bennington College. She has taught art at many age levels, from preschoolers to adults, and currently offers painting workshops and drawing and painting classes for groups and private students. Her work can be found in many public and private collections, Her paintings were chosen for the set design in the 2017 film, “It Comes at Night”, directed by independent film maker, Trey Edward Schultz. Since 1998 Anne has been painting her animals and her friends' animals. This love for animals is shared in every card and gift we sell at Anne Made. I have been painting watercolors almost exclusively of fish for the past 14 years. What started as an expression of my passion for fishing has evolved into a career and I am grateful to all of the art collectors, friends, and family who have helped make this happen. As I reflect on where my work is now and where it is going, it is clear that the act of painting fish is no longer just a tangential expression of my passion for something else, it is a passion in and of itself. The content of my paintings has generally moved from loose ethereal seascapes to precise scientific studies. The state of mind I must be in to create these is a kind of meditative escape (hence the name Escape Studio) and I am addicted to it. Oddly enough I have no shortage of creative inspiration—if life would allow, I feel as if I could paint all day everyday. Carol E.S. MacDonald addresses issues of human and environmental connections, evolution, and healing in her monoprints and original limited edition fine art prints. The monoprints are printed on an etching press. They often combine painting, drawing, etching, collage, and sewing in a unique, one of a kind form. The limited edition prints are hand printed using linoleum or wood block, silkscreen, etching and collagraph. MacDonald was given the 2008 Barbara Smail Award by Burlington City Arts. In 1999 she received the Susan B. Anthony Award from the YWCA for leadership in the arts. Her work has been shown nationally and internationally and is in many corporate and private collections. My philosophy of art is simple. Art should reflect the inner being of the artist. It should communicate to the viewer through the visual sense but also though a shared connection that portrays the intuitive sublime, going beyond what is seen on the canvas or three-dimensionally in sculpture to affect and permeate the feelings of those who come in contact with the work. In the Luminists, this connection was found in their unique experience with their external environment. My goal in pursuing ways to extend my art is to find this connection and imbue my Vermont landscapes with the mysticism that is so much part of the environment and my world. readers ofSeven Days, Vermont’s alternative newspaper, dug Nap is a self-taught artist who was born and raised in Vermont. Whether they are paintings, prints, poems, or monologues, dug Nap has been creating things for most of his life and that is what he is happiest doing. His paintings are in many private collections and his work has been part of group exhibitions in New York City. dug Nap is hard to categorize, but probably falls somewhere between folk art and outsider art. His whimsical paintings and prints tend to be both absurd and serious, drawing parallels between the humorous and the banal. Jess Polanshek is an Illustrator who draws most of her inspiration from the wooded hills of Vermont. Her work revolves around the forest and its inhabitants, often incorporating surreal or fantastical imagery. 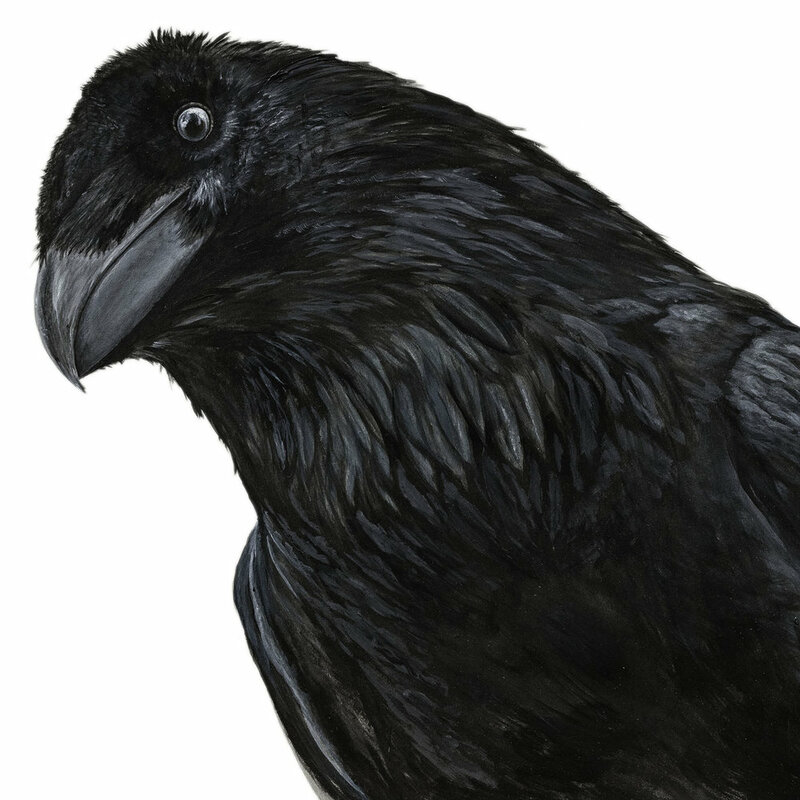 Sarah Rosedahl is an artist and recovering software engineer. After working in the high tech industry for 30 years in California and New Orleans, Sarah now lives on a small farm in Vermont where she is inspired by the wildlife and agriculture of the Lake Champlain Islands. 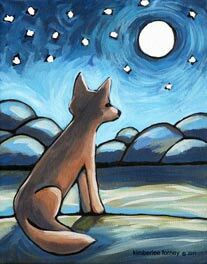 Sarah works in watercolor, acrylic and mixed media and especially enjoys painting birds, both wild and domestic. Sarah is the author and illustrator of “Chickens! Illustrated Chicken Breeds A to Z”, “Chickens! Illustrated Chicken Breeds A to Z Coloring Book”, “Difficult Chickens” and “Difficult Sheep & Friends.” Sarah is illustrator for Sloggers’ Chicken Collection and Cowabella rain boots and garden shoes. Marilyn’s pastels are created with freedom of gesture and moody, dream-like compositions. 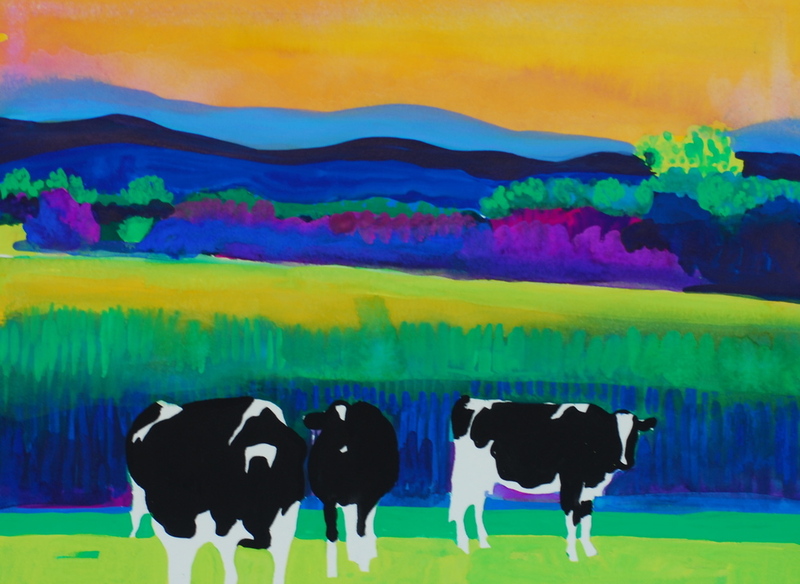 With the Vermont landscape as a reference, rich dark and light contrast reveals energetic and colorful designs that encompass many genres from realism to abstract expressionism. Marilyn is inspired by moving through the physical landscape, whether by bike or skis, collecting mental notes about color and shape to bring back to the studio. The fresh air and physical fitness help to bring ideas to life on the page. There is always something different to discover and therefore always something new at the easel. Kevin Ruelle lives in the Green Mountains of northern VT. He is the owner of Ruelle Design and Illustration in downtown Burlington. Since 2004, he has been creating a series of faux vintage travel posters. Using uniquely American early 20th century watercolor style in concert with a period airbrush technique, Kevin creates the art deco Vermont poster that nostalgia calls for but adds the perspective that only a Vermonter could have. Judith was an art instructor for more than forty years. She learned much from her students. Children and their spontaneity were the fabric of her life. She loved how they explored their surroundings, how they boldly applied color, how they manipulated materials and transformed those materials to find their own vision. For the past dozen years Judith has been exploring watercolors and acrylics. Her work is focused on her love of the outdoors and the beauty that surrounds her both in Vermont and Florida. 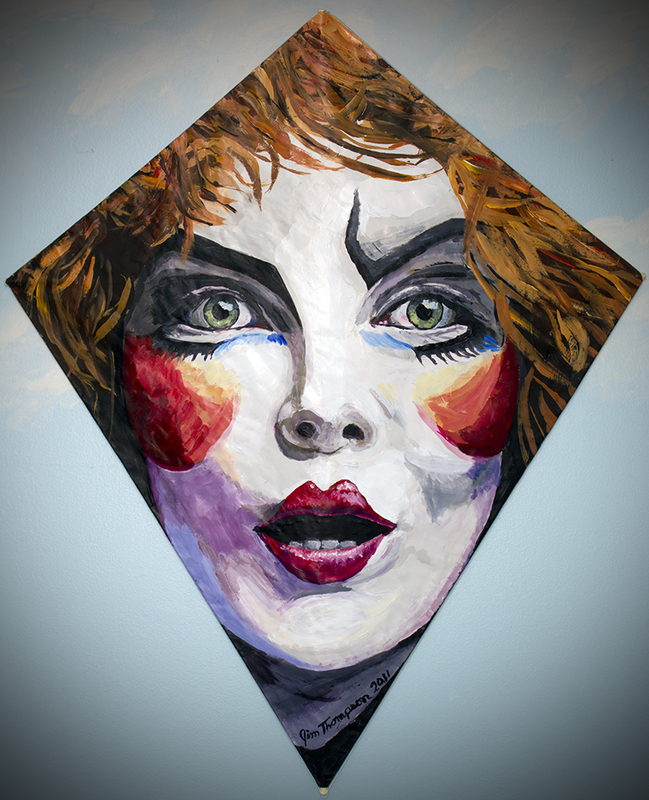 She has been opening up her style using bold color washes and playing with the negative space in the painting. And like a child, she has worked with wild abandon. The studio has become her retreat; it is the place she goes to explore and create. Michelle Turbide creates colorful, narrative images that explore the theme of transformation in the lived experience. Her acrylic and mixed media work is best described as abstract, mysterious dreamscapes with hints of realism. 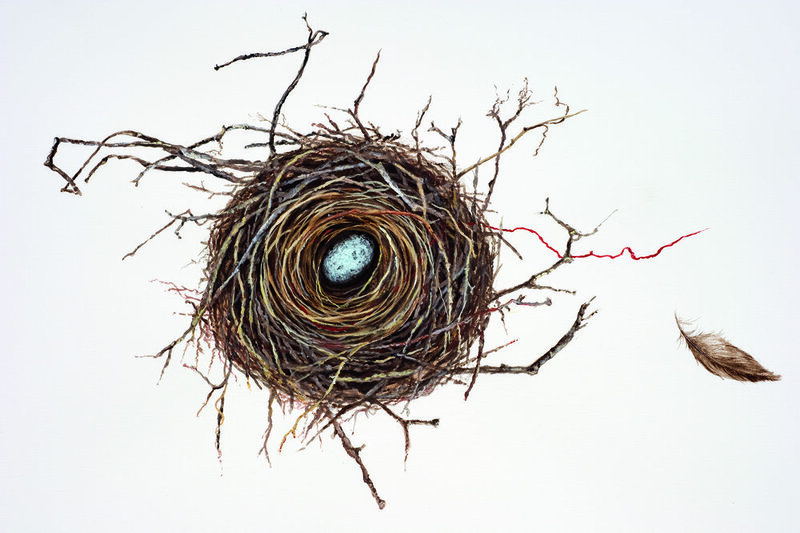 Michelle lives and creates in her home studio in Grand Isle Vermont. She is inspired by the metaphor of nature in parallel with the human journey regarding resilience, spirituality, and empowerment. Jim Thompson’s unique kites are a wonder to see: a menagerie of beasts and birds and an occasional human. These are traditional diamond-shaped kites constructed of brown craft paper on a frame of wooden dowels and fish line. On each Jim uses acrylics to paint a face with eyes staring directly at the viewer, so when in the gallery you have the sense that it is you and not them who is being viewed. Some gaze at you with curiosity, some with pleasure, some with caution, and some seem to stare in judgment. These kites are designed to fly, but few owners dare to take them outside.Those who do fly them report that they take on an even stronger personality when the wind breathes life into them. Jim Thompson is an educator, musician and artist who has lived most of his life in Montpelier, Vermont. Although he made a few kites in the early 70’s, it wasn’t until March of 2011 that he took up the craft in earnest after a neck injury left him out of work and unable to perform music.Since then he and his kites have been featured in many publications, on radio, and on WCAX TV’s “Made in Vermont” segment.